A couple of years ago, one of my friends really wanted me to speak at TED so he offered me a six thousand dollar ticket to check it out. I couldn't justify that kind of an entrance fee, :) so I declined while explaining: "There's no rush. It'll happen if and when the time ripens." Instead of pushing for an outcome, if you wait for the organic pull, I've found that the value generation takes an entirely unique trajectory. You arrive in a web of interconnections and become a catalyst for far deeper engagement. 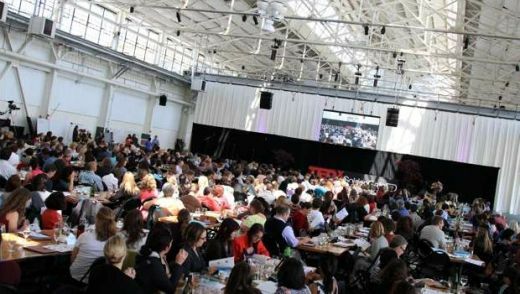 Though not the main TED event, last weekend I spoke at TEDx Compassion at the Craneway Pavillion in Richmond. Close to 700 people attending in person, live-webcast online, simultaneous translation via sign language, four concurrent graphic recorders taking visual notes, a stellar roster of speakers and performances. The whole production, spearheaded by Prospect Sierra, was a year in the making and well organized. But from an internal perspective, it didn't feel like a big deal -- it just felt natural. That natural-ness is courtesy of the pull-model and allows the the focus to be on the things that matter -- ripples. I've always wanted to change the world. I was always that girl who took the extra step to make sure everyone is happy, and a great day for me is volunteering at the hospital, complimenting everyone I see, giving out smiles and hugs, and most importantly, listening to people. [...] I want to help everyone. I want to change the world. And more than anything, I want to meet other people and be inspired by those who ARE changing the world. In fact, way more people wrote in than we had tickets for -- so we gave them away to folks who were *not* all that connected to CharityFocus. Spread the love. :) Soon, though, Lachmin signed up to volunteer, connected with one of the organizers and found out that they needed more volunteers ... and another dozen CF'ers signed up to serve. A bunch more bought tickets too. We had also recommended a few local leaders, like Megan at Mindful Schools and Randy at Project Happiness. And then there were the folks who end up knowing about us through our work. Just like that, a posse emerged before the event even started. Like that, there were connections everywhere. Years ago, I remember Nancy Rivard telling me about her friend Nancy McGirr -- one fine day, she quit her war-time photography job, bought a bunch of disposable cameras and headed to the shanti-towns of South America without a plan. She ended up publishing a book of those kids' photos called 'Out of the Dump' and continues to work there, decades later. Similarly, Shabnam Agarwal was a friend of Neil Patel. She is big on the importance of failure in education -- "Why do we think that falling off a bike is a natural part of learning to ride but failing in Math is not?" Many CF'ers had told me about how Roots of Empathy uses babies to battle bullying, and it was a pleasure to meet Mary Gordon as well. 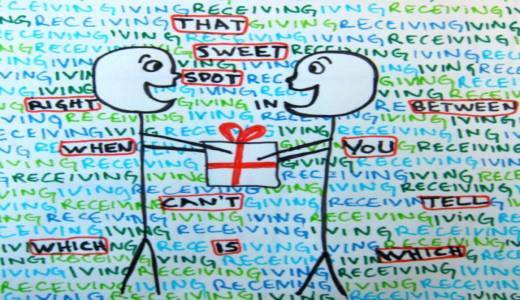 The gift-economy idea resonated with many folks. Right as I finished the talk, a woman came up to me and said, "I travelled all the way Montreal, Canada, to be here -- and if the only talk I had heard was yours, it would've been worth it." We chatted for a few minutes, and I started telling her stories of the CF'ers around us. Pancho was on deck, as was Edwin. Sure enough, the next day, she came to Karma Kitchen with Edwin and connected with Pancho (she now hopes to interview him and his roommates for their Casa de Paz work in East Oakland). Another woman came upto me, hugged me, and said, "I'm from Australia, and just want to say that I subscribe to all your email newsletters and I love all that you guys stand for!" The event curator, the indefatigable Kathryn Lee, later wrote, "When I ask people about the talks that moved them, everyone includes yours!" Glad it served the purpose for some. I just looked at the RSVP list for this Wednesday, and lo and behold, James Doty had signed up to attend. He now runs the Center for Compassion and Altruism at Stanford. At the event, he had shared a powerful story about his challenging early life, going on to lead major technology companies and then ultimately, giving away *all* his stock in a major company he had helped build, just "to liberate myself." All of this is just as of today. With so many CF'ers there to spread their webs of compassions in so many directions, it is easy imagine that the ripples will continue to unfold in umpteen directions. Its a movement that simply can't be stopped since its not driven by external incentives nor is it centralized. Such events could be an opportunity to broadcast; and the tech savvy might embrace social media to deepen some of that engagement, but still, a ton of value is lost. To truly catch (and multiply) that inner and outer potential, it's all about decentralizing, broadening and distributing -- receive a kind act at the coffee shop and pay-it-forward at the lunch line; gift tickets to folks like Susi to broaden the circle; divert attention to grassroots people in the posse like Pancho; engage in the ripples at Karma Kitchen in a way that's even more generative. When the collective does this for a dozen years over hundreds of events, it is no surprise to see why the pull-model expresses itself so elegantly in the CharityFocus ecosystem. Update, July 17th: the video of the talk! Beautiful synopsis, Nipun... connecting the dots, tying threads backwards and creating ripples into the future... so many interconnections.